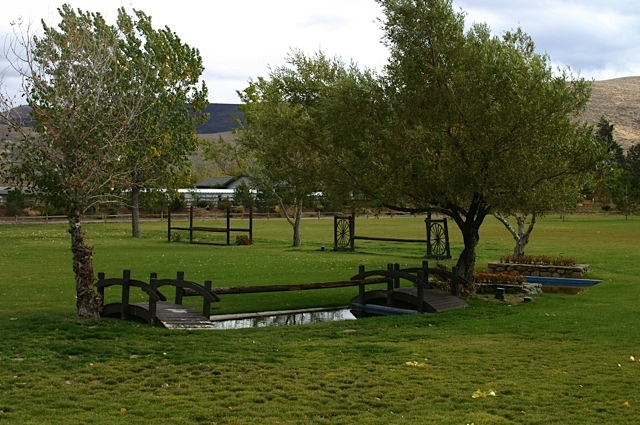 Maplewood Stables is located in beautiful Pleasant Valley, Nevada, approximately 10 miles south of Reno on Highway 395. It's situated on 165 gorgeous acres, including trails, ponds, hills and creeks. Most of our acreage is devoted to park, trails and turn-out available for you and your horses to enjoy. Maplewood's stabling, turn-out and training facilities are designed to accommodate a variety of riders and horses, from beginners and green/young horses to top-level competitors. Maplewood boasts an expansive indoor arena, a large outdoor arena and multiple round pens for training. Maplewood's resident horses enjoy daily turnout, from small paddocks to acres of grass. Broodmares and foals spend their days in leisure, grazing and playing in our largest fields, where they have access to natural terrain and creeks. Maplewood has an on-site tack store in Reno called The Hilltopper English Store. This tack store supplies our stable with custom-made boots, chaps, blankets and trunks, as well as bridles, saddles, pads, new and gently worn riding clothes, and horse care products. The store hours are Tuesday-Sunday, 9 am to 5 pm or by appointment.